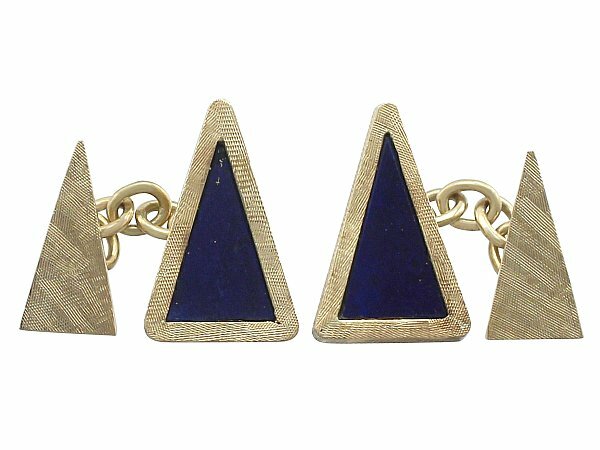 These fine and impressive vintage lapis lazuli cufflinks have been crafted in 18 ct yellow gold. 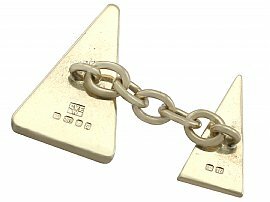 The links have a triangular form, the anterior link being larger. 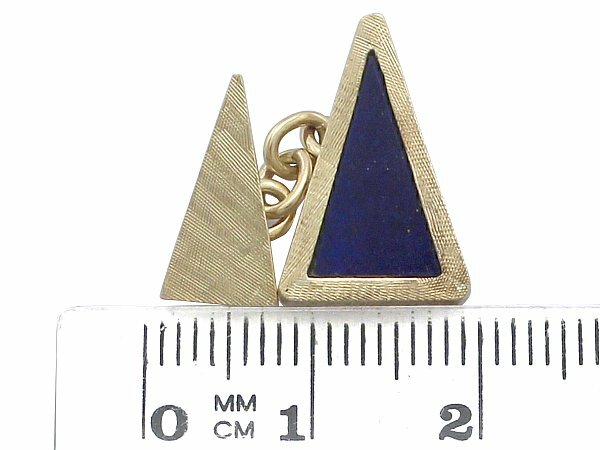 The anterior links are ornamented with an inset lapis lazuli panel, framed by a textured border. The smaller posterior links are embellished with the same textured decoration. The cufflinks articulate to the reverse via a five link chain. 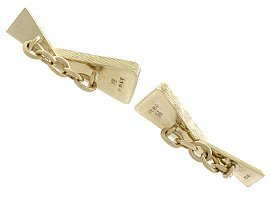 The cufflinks are hallmarked to the reverse with the maker's mark 'CVEW', the gold guarantee mark (crown), the 18 ct mark (18), the London Assay Office hallmark (leopard's head) and the date letter for 1971 (q). 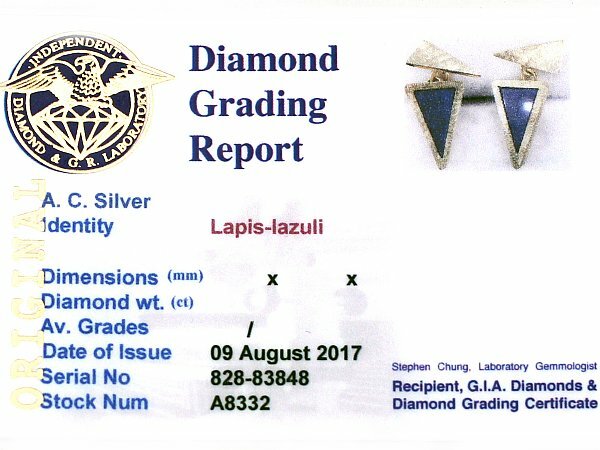 This impressive pair of vintage English cufflinks is supplied with an independent diamond grading report card. These impressive vintage cufflinks are exceptional quality set with lapis lazuli panels. 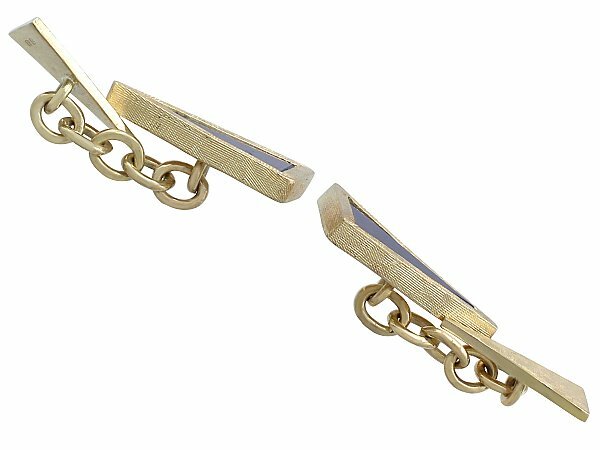 The cufflinks are a very good gauge of gold and are in excellent condition with clear hallmarks to the reverse. Length of anterior link 1.78cm/0.7"
Width of anterior link 1.13cm/0.44"
Length of interior link 1.42cm/0.56"
Width of interior link 7.25mm/0.29"